Fans of classic 80's movies certainly know the title of this post is a line from the Tom Hanks movie, Bachelor Party. My college pal Val joined me in Boston over the weekend and one late night was spent at Jacque's Cabaret, the best place in Boston to hold a bachelorette party. 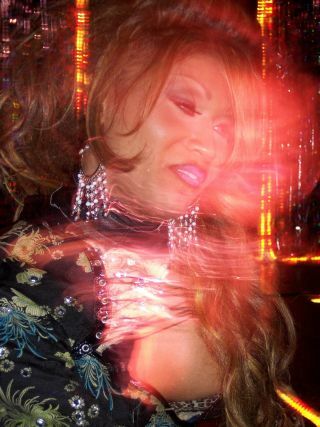 Jacque's is a transgender bar featuring performances by mostly talented drag queens. Performances were primarily PG-rated, the four "girls" danced and lip-synch for a 90-minute show. Visiting during the week, the bar is sprinkled with pool-playing locals. But on Friday and Saturday nights, the place is packed with bridal parties. This is a shot of Destiny.